Are you in the market for a brand new 2018 Kia vehicle? With the help of the staff here at Kendall Idaho Center Auto Mall, we can work with you to help you find a Kia that suits all of your needs and desires in a new car, van, or SUV. We have an expansive selection of new Kia cars available to our customers. 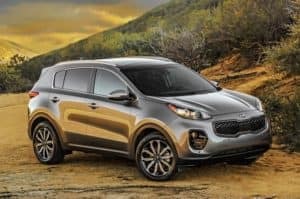 Check out popular vehicles, including the new 2018 Kia Optima, 2018 Kia Sorento, 2018 Kia Sportage, and many more. Learn more about these vehicles and all other Kia services we offer at Kendall Idaho Center Auto Mall by getting in touch with our sales team! Contact us online to see how we can help you get behind the wheel of the perfect Kia for you. We look forward to hearing from you and helping you during your next visit to our Kia dealership, conveniently located at 15700 Idaho Center Blvd. Nampa, Idaho 83687, also serving the areas of Boise, Kuna, and Eagle! Find the car, van, or SUV of your dreams when you come look at our new inventory of 2018 Kia vehicles in Nampa. With a variety of customization options for your new 2018 Kia, the staff at Kendall Idaho Center Auto Mall is convinced that we can find a new car that suits all of your needs in the Nampa area. You can browse our current in-stock inventory of new Kia cars to view our entire Kia lineup. Kendall Idaho Center Auto Mall is a full-service Kia dealership in Nampa. If you’re in the market for a new Kia Sedona or Kia Rio, we’ll have what you’re looking for. Besides our inventory of new 2018 cars and SUVs, we also have a large selection of used cars in Nampa, as well as a financing department to assist customers with securing a car loan. Ready to learn more? Contact us by phone, or visit our new Kia dealership. Are you looking for a new vehicle that is perfect for your lifestyle? Consider the many new Kia options we have available within our new inventory here at Kendall Auto Mall. We are excited to offer several new 2018 Kia options to our customers from Nampa and other nearby areas, such as Meridian and Caldwell. We believe that we have a Kia to fit everyone. Browse our inventory where you’ll find exciting options such as the 2018 Kia Forte, 2018 Kia Soul, and 2018 Kia Cadenza. If you’d like to schedule a test drive or if you have any questions about the Kia cars in our inventory, please contact our sales team. We look forward to helping you get behind the wheel of the Kia of your dreams next time you visit us at Kendall Idaho Center Auto Mall.